GPF: Shows and Conventions: The Con Shirt of Doom! The Con Shirt of Doom! 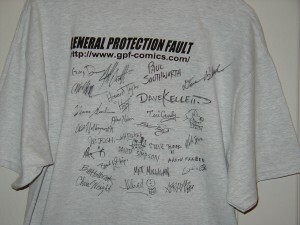 In the summer of 2001, while attending Comic-Con International 2001, we here at GPF started a new tradition: The Con Shirt of Doom! It started life as just another large gray Fred "Get Cultured" T-shirt, but in being passed back and forth between the sweaty palms of online cartoonists and emblazed forever by the immortal Rub-A-Dub laundry pen, was transformed into something new and exciting. This ever-growing shrine to online comics goes with us everywhere we go, for the enjoyment of fans (and so we can get more signatures). It bears the names of legends and soon-to-be legends, as well as a few ugly, boring people that happen to draw silly pictures for fun. Here is the complete, current list of 46 online cartoonists and special members of the online comics community, in alphabetical order, who have signed The Con Shirt of Doom! This list will grow as we take it from place to place and meet more online cartoonists in person.